WINNER OF THE WEEK: Jimi Hendrix. What appears to be the late guitar hero's final studio album, consisting of unreleased tracks recorded with a variety of musicians between 1968 and 1970, sold 72,000 copies and made its debut at Number Two. It's a little creepy to have to report this, but People, Hell & Angels is Hendrix' highest-charting album since 1969. Unsurprisingly, it seems to be a physical-CD phenomenon – it reached only Number Five on iTunes Top Albums chart, with Luke Bryan's Spring Break . . . Here to Party, Macklemore and Ryan Lewis' The Heist, Bruno Mars' Unorthodox Jukebox and Imagine Dragons' Night Visions placing higher. It's not often these days that the iTunes and Billboard 200 charts suggest such a clear-cut dichotomy between older-artists-equals-physical-sales and younger-artists-equals-download-sales. LOSER OF THE WEEK: New music. Luke Bryan's Number One album Spring Break . . . Here to Party makes its debut with 145,000 copies – impressive since almost none of these tracks are new. They came out between 2009 and 2012 via four online-only EPs. (This business model, putting out a bunch of online music then later packaging it as a physical CD, doesn't often happen in country music – it's associated with alternative-rockers such as Nine Inch Nails and Radiohead. It'll be interesting to see if Bryan's contemporaries head down the same path.) 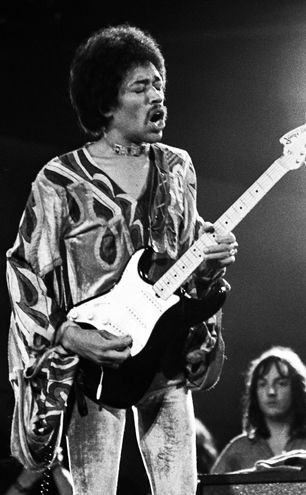 Following Bryan in the Undead Top 10 are Jimi Hendrix (see above), Bruno Mars' Unorthodox Jukebox(51,000 sales), Mumford and Sons' Babel (35,000), Macklemore & Ryan Lewis' The Heist (29,000) and Rihanna's Unapologetic (29,000). The latter four albums came out last fall. When will this new-release dead zone end? Well, Justin Timberlake's The 20/20 Experience arrives Tuesday, it's streaming via iTunes and is Number Seven on Apple's Albums Chart as a pre-order. ROCK IS DEAD – LONG LIVE TOP 40 BANDS WITH GUITARS: Chart-followers should keep an eye on Imagine Dragons, whose sprightly pop-and-rock sound is in the same wheelhouse as Maroon 5 and fun. The band has been touring steadily and doing all the right TV appearances (notably Letterman in late February). The reward this week is cracking radio's Top 40 as well as 26,000 in sales, an increase of 8 percent and a jump from Number 15 to Number Eight; the rise on iTunes is from Number Seven to Number Four. The band's latest single "Radioactive" made its move on the Ultimate Chart, which measures Internet criteria, two weeks ago, and is holding at Number 14.